Sir Edward Elgar, 1st Baronet, OM, GCVO (June 2, 1857 – February 23, 1934) was an English Romantic composer. Several of his first major orchestral works, including the Enigma Variations and the Pomp and Circumstance Marches, were greeted with acclaim. He also composed oratorios, chamber music, symphonies and instrumental concertos. He was appointed Master of the King's Musick in 1924. The son of a musician (his father was a church organist) Elgar was exposed to liturgical music from his earliest years and was deeply inspired by scripture. He was to compose many works based on scriptural references and several of his large-scale works (The Apostles, The Kingdom and The Dream of Gerontius) are based on Christian narratives. Commenting on his views of the Almighty, Elgar writes, "God when influencing persons is called the Spirit of God. The Spirit of God is nothing less than God, it is God." Edward William Elgar was born in the small village of Lower Broadheath outside Worcester, Worcestershire, to William Elgar, a piano tuner and music dealer, and his wife Ann. The fourth of six children, Edward Elgar had three brothers, Henry, Frederick and Francis, and two sisters, Lucy and Susannah. His mother, Ann, had converted to Catholicism shortly before Edward's birth, so Edward was baptized and brought up as a Roman Catholic. Surrounded by sheet music and instruments in his father's shop in Worcester's High Street, the young Elgar became self-taught in music. On warm summer days, he would take manuscripts into the countryside to study them (he was a passionate and adventurous early cyclist who learnt to cycle from the very early age of five). Thus there began for him a strong association between music and nature. As he was later to say, "There is music in the air, music all around us, the world is full of it and you simply take as much as you require." Having left school at the age of 15, he began work for a local solicitor, but after a year embarked on a musical career, giving piano and violin lessons. At 22 he took up the post of bandmaster at the Worcester and County Lunatic Asylum in Powick, three miles south-west of Worcester. He composed here too; some of the pieces for the asylum orchestra (music in dance forms) were rediscovered and performed locally in 1996. In many ways, his years as a young Worcestershire violinist were his happiest. He played in the first violins at the Worcester and Birmingham Festivals, and one great experience was to play Antonín Dvořák's Sixth Symphony and Stabat Mater under the composer's baton. Elgar was thrilled by Dvořák's orchestration and this remained an influence on his own style for more than a decade. At 29, through his teaching, he met (Caroline) Alice Roberts, a Major-General's daughter (shades of Gilbert and Sullivan) and an author of verse and prose fiction. He married her three years later against the wishes of her family, giving her as an engagement present the short violin and piano piece Salut d'amour. The Elgars moved to London to be closer to the centre of British musical life, and Edward started composing in earnest. The stay was unsuccessful, however, and they were obliged to return to Great Malvern, where Edward could earn a living teaching. In 1899, at the age of 42, his first major orchestral work, the Enigma Variations, was premiered in London under the baton of the eminent German conductor Hans Richter. It was received with general acclaim, establishing Elgar as the pre-eminent British composer of his generation. This work is formally titled Variations on an Original Theme; the word "Enigma" appears over the first six measures of music, which led to the familiar version of the title. The enigma is that, although there are fourteen variations on the "original theme," the 'enigma' theme, which Elgar said 'runs through and over the whole set' is never heard. Many later commentators have observed that although Elgar is today regarded as a characteristically English composer, his orchestral music and this work in particular share much with the Central European tradition typified at the time by the work of Richard Strauss. Indeed, the Enigma Variations were well-received in Germany. The following year saw the production at the Birmingham Triennial Music Festival of his choral setting of Cardinal Newman's poem The Dream of Gerontius. Despite a disastrous first performance due to poorly-prepared performers, the work was established within a few years as one of Elgar's greatest, and it is now regarded as one of the finest examples of English choral music from any era. Elgar is probably best known for the five Pomp and Circumstance Marches, composed between 1901 and 1930. Shortly after he composed the first march, Elgar set the trio melody to words by A.C. Benson as a Coronation Ode to mark the coronation of King Edward VII. The suggestion had already been made (allegedly by the future King himself) that words should be fitted to the broad tune which formed the trio section of this march. Against the advice of his friends, Elgar suggested that Benson furnish further words to allow him to include it in the new work. The result was Land of Hope and Glory, which formed the finale of the ode and was also issued (with slightly different words) as a separate song. 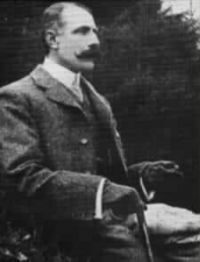 Between 1902 and 1914 Elgar enjoyed phenomenal success, made four visits to the USA including one conducting tour, and earned considerable fees from the performance of his music. Between 1905 and 1908 Elgar held the post of Professor of Music at the University of Birmingham. His lectures there caused controversy owing to remarks he made about other English composers and English music in general; he was quoted as saying "English music is white - it evades everything." The University of Birmingham's Special Collections contain an archive of letters written by Elgar. Elgar's Symphony No. 1 (1908) was given one hundred performances in its first year, the violin concerto (1910) was commissioned by the world-renowned violinist Fritz Kreisler, and in 1911, the year of the completion of his Symphony No. 2, he had the Order of Merit bestowed upon him. Elgar's musical legacy is primarily orchestral and choral, but he did write for soloists and smaller instrumental groups. His one work for brass band, The Severn Suite (later arranged by the composer for orchestra), remains an important part of the brass band repertoire. It is occasionally performed in its arrangement by Sir Ivor Atkins for organ as the composer's second Organ Sonata; Elgar's first, much earlier (1895) Organ Sonata was written specifically for the instrument in a highly orchestral style, and remains a frequently-performed part of the English Romantic organ repertoire. He was the first composer to extensively make recordings of his own compositions. HMV (His Master's Voice) recorded much of his music acoustically, then began a series of electrical recordings in 1926 that continued until 1933, including his "Enigma Variations," "Falstaff," the first and second symphonies, his cello and violin concertos, all of the "Pomp and Circumstance" marches, and other orchestral works. Part of a 1927 rehearsal of the second symphony with the London Symphony Orchestra was also recorded and later issued. In the 1932 recording of the violin concerto, the aging composer worked with the American violinist Yehudi Menuhin, who was then only 16 years old; they worked well together and Menuhin warmly recalled his association with the composer years later, when he performed the concerto with the San Francisco Symphony Orchestra. Menuhin went on to record an award-winning version of Elgar's Cello Concerto with the cellist Julian Lloyd Webber. Elgar's recordings usually featured such orchestras as the London Symphony Orchestra, the New Symphony Orchestra of London, and the Royal Albert Hall Orchestra. Elgar's recordings were released on 78-rpm discs by both HMV and RCA Victor. In later years, EMI reissued the recordings on LPs and CDs. He died on February 23, 1934, and is buried at St. Wulstan's Church in Little Malvern. Within four months, two more great English composers—Gustav Holst and Frederick Delius—were also dead. The statue of Edward Elgar at the end of Worcester High Street. The house in Lower Broadheath where Elgar was born is now a museum devoted to his life and work. The statue of him at the end of Worcester High Street stands facing the cathedral, only yards from where his father's shop once stood. Another statue of the composer is at the top of Church Street in Malvern, overlooking the town and giving visitors an opportunity to stand next to the composer in the shadow of the Hills which he so often regarded. In September 2005, a statue sculpted by Jemma Pearson was unveiled near Hereford Cathedral in honor of the few years Elgar lived in the city. A portrait of Sir Edward Elgar can be found on the Bank of England twenty pound note. Elgar's sketches for his third symphony were elaborated in the 1990s by the composer Anthony Payne, who has also subsequently produced a performing version of the sketches for a sixth Pomp and Circumstance march, premiered at the Proms in August 2006. Elgar's sketches for a piano concerto dating from 1913 were elaborated by the composer Robert Walker and first performed in August 1997 by the pianist David Owen Norris. The realization has since been extensively revised. The hit track Clubbed To Death by Rob Dougan, featured on soundtrack to the 1999 movie The Matrix, is partially based on Enigma Variations. Elgar is credited with having revived the English compositional tradition. Not since the time of Henry Purcell (1659-1695) had an English composer achieved the notoriety that Elgar had. Foreign composers such a Handel, Haydn and Mendelssohn had attained considerably more acclaim in England during the seventeenth and eighteenth centuries than any English composer. Elgar's rise to the status of world-class composer was the beginning of a renaissance of English music that would eventually lead to the ascent of other notable English composers, including Ralph Vaughan-Williams and Frederick Delius. "[Elgar's music is] wonderful in its heroic melancholy." William Butler Yeats on the incidental music for "Grania and Diarmid". 1904 - Elgar was made a knight bachelor. This entitled him to the title 'Sir Edward Elgar', but no post-nominal letters. 1911 - He was admitted to the Order of Merit. He was now 'Sir Edward Elgar OM'. 1928 - Elgar was created a Knight Commander of the Royal Victorian Order, becoming 'Sir Edward Elgar OM KCVO'. 1931 - He was made a baronet, becoming 'Sir Edward Elgar Bt OM KCVO'. A baronetcy is an hereditary honour, but is passed on only through the male line. As Elgar had only a daughter, the baronetcy became extinct on his death. 1933 - Elgar was promoted within the Royal Victorian Order to Knight Grand Cross. He was now 'Sir Edward Elgar Bt OM GCVO'. Between 1900 and 1931 Elgar received honorary degrees from the Universities of Cambridge, Durham, Leeds, Oxford, Yale (USA), Aberdeen, Western Pennsylvania (USA), Birmingham and London. Foreign academies of which he was made a member were Regia Accademia di Santa Cecilia, Rome; Accademia del Reale Istituto Musicale, Florence; Académie des Beaux Arts, Paris; Institut de France; American Academy of Arts. The Smoking Cantata for baritone soloist and orchestra. Written in 1919, this piece was probably never intended to be performed and was given the absurd opus number of 1001. Its duration is less than a minute. ↑ BBC Elgar's piece premiered at Proms August 2, 2006. Retrieved April 20, 2008. ↑ Unknown Elgar is just a puff of smoke The Guardian. Retrieved September 15, 2008. Hamilton-Patterson, James. Gerontius. Soho Press, 1989. A historical novel that gives an imagined account of an actual cruise to South America that Elgar took in 1923. Kennedy, Michael. Portrait of Elgar, 3rd ed. Oxford: Clarendon Press, 1987. McVeagh, Diana. Elgar the Music Maker. Boydell Press, May 2007. Moore, Jerrold Northrop. Edward Elgar: a creative life. Oxford: OUP, 1984. Moore, Jerrold Northrop. Elgar – A Life in Photographs. Oxford: OUP, 1972. Moore, Jerrold Northrop. Elgar – Child of Dreams. Faber and Faber, 2004. Reed, William H. Elgar as I knew him. Oxford: OUP, 1989. Ward, Yvonne M. 'Gosh! Man I've got a tune in my head: Edward Elgar, A.C. Benson and the creation of "Land of Hope and Glory"' The Court Historian. Volume 7, No.1, 2002. Young, Percy. Alice Elgar: enigma of a Victorian lady. London: Dobson, 1978. Young, Percy. Elgar OM: a study of a musician, 2nd ed. London: Purnell, 1973. Link to music - Cello Concerto in E Minor, Op. 85 recording from Musopen. Retrieved July 18, 2007. This page was last modified on 22 September 2017, at 20:39.